The miConverter Gx is a miniature 1000BASE-T RJ-45 copper to 1000BASE-X fiber Gigabit Ethernet media converter that provides cost-effective fiber connectivity from Gigabit switches to diagnostic equipment, desktop and laptop computers. The miConverter Gx is the first Gigabit media converter powered by a USB port (1.0, 1.1, and 2.0). The miConverter Gx is a miniature 1000BASE-T RJ-45 copper to 1000BASE-X fiber Gigabit Ethernet media converter that provides cost-effective fiber connectivity from Gigabit switches to diagnostic equipment, desktop and laptop computers. The Gx features Small Form Pluggable (SFP) transceivers that support 1000BASE-X for interoperability with Gigabit fiber equipment. SFP transceivers enable adaptability to different fiber types, speed and distances, and support Coarse Wave Division Multiplexing (CWDM) technology to increase the bandwidth capacity of fiber infrastructure. 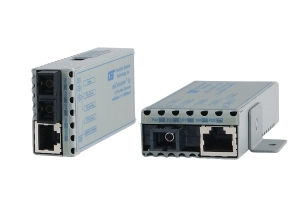 The Gx fixed fiber models support multimode and single-mode dual fiber with ST, SC and LC connectors; and single-mode single-fiber with SC connectors. The Plug-and-Play capability of the miConverter Gx simplifies fiber-to-the-laptop and fiber-to-the-desktop deployments. The miConverter Gx features auto-negotiation, which allows connected network devices to auto-negotiate their Duplex and Pause modes. The miConverter Gx also provides manual configuration with built-in DIP-switches for compatibility with legacy Gigabit fiber products. These features ensure the miConverter Gx is compatible with the widest range of Gigabit fiber equipment. The LED indicators provide visual diagnostic information such as availability of power, port activity, link status, and duplex modes to assist in network installation and maintenance. The miConverter Gx combines Gigabit Ethernet connectivity with the lightweight design and low-power consumption required for both permanent deployment and temporary facilities. The external AC power supply is available in US, Universal and Country/Region specific models. Country/Region specific models feature optional interchangeable connectors, allowing for compatibility with electrical outlet types found around the world. The miConverter Gx can be mounted in the miConverter 18-Module Power Chassis to consolidate individual modules into a rack-mount form factor that can be deployed where multiple fiber optic links are distributed from UTP switch equipment. The chassis powers converter modules with barrelstyle DC connectors, and is available with a single universal AC, 24VDC or 48VDC internal power supply. This compact, high-density chassis is 1.5 rack units high, and can be mounted in a standard 19” or 23” equipment rack. This application example illustrates an Ethernet Enterprise network with a star topology that provides multiple fiber links to remote buildings. In the upper left, three copper UTP links from a core copper switch are converted to three fiber links with a miConverter 18-Module chassis of media converter modules. When fiber core switch is used, the chassis of media converters are not required. The fiber links run to remote buildings, where the fiber at each location is converted back to copper with a standalone miConverter and distributed to end users at different buildings. In all cases, multimode, single-mode, or single-mode singlefiber can be used. The application diagram depicts a laptop computer used in a fiber network. The miConverter connects to the laptop via two cables. The first cable is the USB Power Adapter which draws electrical current from the laptop’s USB (1.0 or 2.0) port to power the miConverter. The other cable is the UTP cable that links the laptop network port and the miConverter copper port. The miConverter converts the UTP signal to fiber signal, which can extend up to 120km. Power from the USB port of the computer is automatically shut off when the computer is powered down, turning off the miConverter when fiber conversion is no longer needed. W: 1.71" x D: 4.10" x H: 0.84"
2When using single-fiber (SF) media converter models, the Tx wavelength on one end has to match the Rx wavelength on the other. Contact Omnitron for replacement power adapters and other accessories.